CLINIC BUS DONATION: Pat Adam, Dylan Tennyson, Ann Marie Fowler and Mark Clemson. 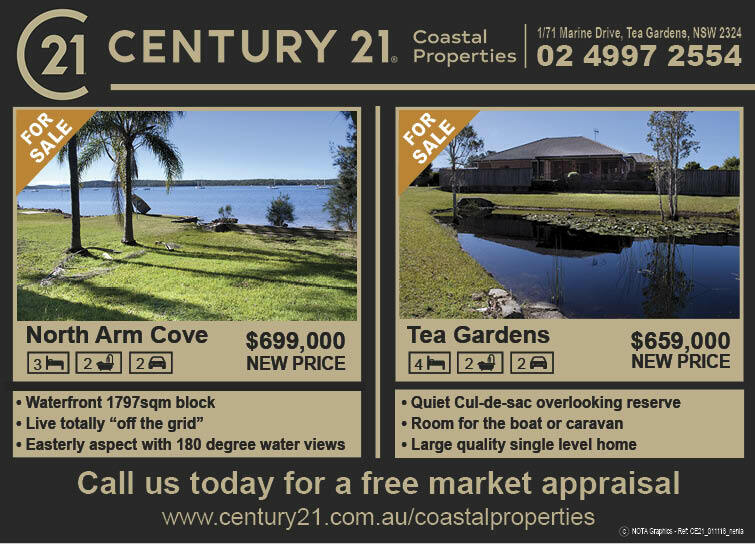 THE community is still reaping the benefits from this year’s Myall River Festival held on Saturday 13 October on the Tea Gardens waterfront. 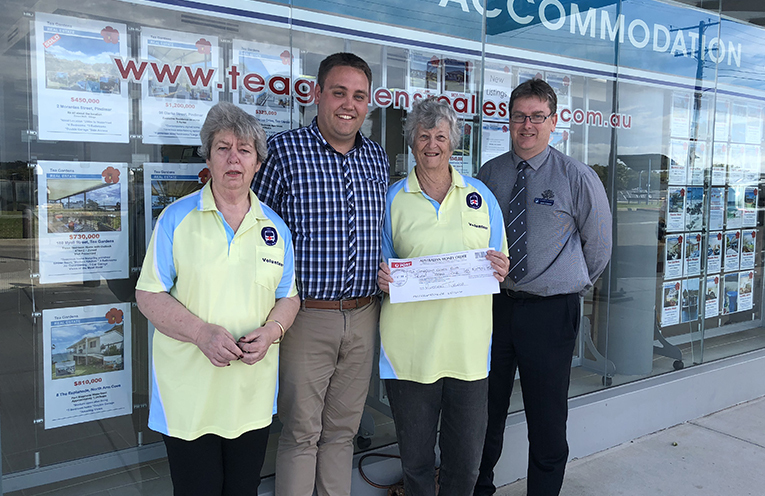 Tea Gardens Public School Principal Mark Clemson was very happy to receive a cheque for $250, part of the proceeds of a Festival raffle sponsored by Ray White’s Stuart Sinclair. “This will be very handy to expand our digital technology at the school,” Mark Clemson said. Another $250 was donated to the Hawks Nest Boxing Gym run by Senior Constable Rob Wylie for our local youngsters. 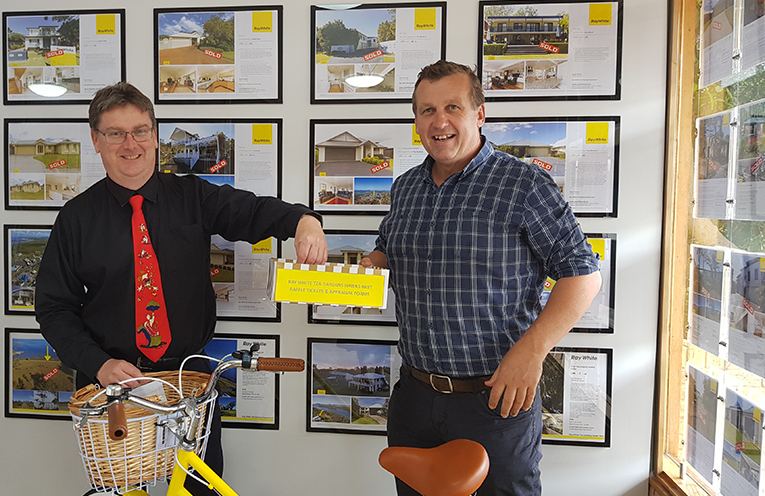 300 tickets were sold for the prize of a bright yellow push bike, complete with basket. The lucky winners were locals Ian and Sam Leggatt. The ‘Clinic’ Bus was also a big winner on the day of the Myall River Festival. Just over $700 was raised for the non- government funded service, thanks to the efforts of Principal Clemson, Casey Connell and Tea Garden’s Real Estate’s Dylan Tennyson who were all happy to give their time on the day of the Festival to be waterlogged over and over again as victims of the dunking machine. Thanks to ongoing donations from the community, the Clinic Bus will continue to operate its expanded timetable of Tuesdays, Wednesdays and Thursdays, ferrying patients to medical appointments and hospital stays in Newcastle, Raymond Terrace and Maitland. SCHOOL DONATION: Principal Mark Clemson and Stuart Sinclair.